Love Your Farm. Love Your Food. We know everyone has different reasons for where they purchase their food, but one thing we’ve found over and over again is that people really want to eat healthier and support local farms. Knowing who grows your food is the first step. Our custom CSA makes getting quality, farm-fresh food and supporting your local farm even easier. We want to grow what you want to eat. When you sign up for a B&B Farms CSA share, you’ll be asked to rate the crops we grow on a scale of “not for me” to “i love it”. Based on a combination of those preferences, and what we have available that week, the Harvie algorithm will build your custom CSA share. Prior to your CSA pickup, you’ll get an email saying “It’s time to customize your farm share”. You’ll have a period of time where you can “swap” crops. Maybe you have enough lettuce this week and instead would prefer extra carrots. No problem! You can simply swap those crops out and pick up what you want! And it's all harvested FRESH! Already a member? Thank you for your support! Refer a friend and earn credits towards farm purchases. There is a “Refer a Friend” tab on all member profile pages along with instructions on how you can share and receive credits. The Happiest Hour: a farmer chef collaborative. Each event, meet and greet with the farmers and chefs, and special guests from small businesses whom share our passion for growing local and commitment to elevating the innovative food culture of South Jersey. Experience amazingly delicious farm dishes; support B&B Farms and the community. Casual, small bites. Mingle. BYOB. special guest: The Seed: a living beer project, coming soon to AC. In 2018, we raised a small number of pigs for meat - on pasture, no hormones, antibiotics or steroids. Animals were fed a wholesome diet of farm veggies, grain, local bakery scraps and spent brewery grain. We are proud of how we care for our pigs; they are ethically treated, healthy and happy! Pre-orders only. Pickup at Hammerbacher on Saturday’s, beginning Jan 12th, 10 am-1 pm, until sold out. 2019 CSA VEGGIE SHARES - TAKING ORDERS SOON! Farm Dinner tickets on sale now! Seating is limited; CSA members can purchase tickets at a discount rate $69 each (promo code sent to your email). Open to public for $79 each. We hope you can join us for this event; it's a great night on the farm! Join us in the Barn Thursday night! 7-9 ish. BYO beverages, chairs, snacks. Or grab a Hammerbacher brew box (limited at door). CROPS. New! Kale AND Winter squashes (Butternut, Buttercup), Also Spaghetti. The cooler temperatures this week have us in a fall like mood :) Eggplant, Tomatoes (plums, red beef steaks, heirlooms). Scallions, Onions, Garlic, Potatoes (red, white and blues). Tomatillos, Peppers. NO Cucumbers and Zucchini – we have more planted for later harvest. Cantaloupe? Not a great year for melons – they are not holding well. Seconds for sale, half price if interested. Great flavor! EXTRAS FOR SALE. Support Local! Peaches; Fresh Baked Breads; Cheeses; Chicken Sausages; Eggs. Herbs – Field B – between blueberries and tomatoes – great for drying and fresh bouquets. Lavender (young, takes a while to establish), Thyme, Sage, Oregano, Rosemary, Chives. Extras for sale (by the lb). Sunflowers – Field B – short walk past the tomatoes – look for the orange flags. Extras for sale (by the stem). More Flowers – Field A – just out front parking area – zinnia and straw flower. More Herbs – Field A – just out front parking area – Cilantro, Dill, Basil, Parsley. CHERRY TOMATOES (counts as an item in your farm share). Best field we have had in years! Please pick! Roast and freeze for later use – makes the best appetizer with bread and cheese; add to winter sauces and dishes. CSA PAYMENTS (for payment plans) – breakdown of charges. From here to the end, we will be on a weekly schedule. Thanks for your patience with our new CSA software! Any questions, please let me know. Double payments for Week 7 pickup (7/18-21) AND Week 8 pickup (7/25-28). Single payment for Week 9 pickup (8/1-4). Double payments for Week 10 pickup (8/8-11) AND Week 11 pickup (8/15-18). Next scheduled payment for Week 12 pickup (8/22-25) end of this week. Galloway Farm Market – spread the word – support the vendors! WHEN? Thursdays 4-7 PM through mid-September. WHERE? Galloway Municipal Complex, Jimmy Leeds Rd. Fall Crops – in the coming weeks… broccoli, cabbage, cauliflower, fennel, beets and more. The fall crops look strong and healthy. Beans and Greens (our very best arugula and others) – beginning in a week or 2. On the Table in Farm Shop... New Crops! And more tomatoes (extras for sale!). Mix and Match in Farm Shop this week - the Harvie system is down. PICK-YOUR-OWN: cherry tomatoes and green beans count as items in your farm share. Tomatoes so worth it! Easy to pick. 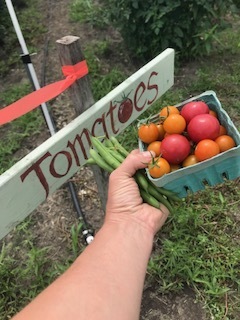 Cherry Tomatoes (orange sungolds and pinks) - please pick - so much out there! Summers gold. Green Beans - last week until new patch ready. Flowers and Herbs - included in all CSA farm shares. 1 bunch each. CSA Week 8. Pickup Wed 1-6 (7/25), OR Sat 9-2 (7/28). Choose whichever works for you this week, no need to let us know. NEW CROPS! Tomatoes (pick-your-own) - orange sungolds and pinks; And more tomatoes in farm shop (classic red and heirloom), just coming in. 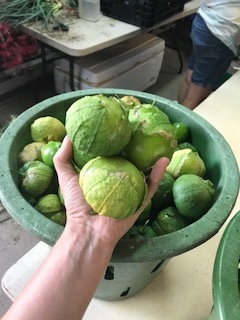 Tomatillos - make salsa verde! so good! Kale back on table. More cucumbers, zucchini, green beans (pick-your-own), cabbage, potatoes, beets, carrots, leeks, peppers, eggplant, scallions and garlic scapes. FARM SHARE BREAKDOWNS: swap online via Harvie email, OR do so in Farm Shop. CORN! Pastore Orchards, Hammonton. Peaches still a week or 2 away - so worth the wait! Fresh Ricotta cheese - Fulper Farms, Lamberville. We will restock on others next week. Chicken sausages - Griggstown Farms. Fully stocked! In the freezer. PICK YOUR OWN - where to pick??? please follow the orange/pink flags. Enjoy picking (and eating) right from the vine! Tomatoes! Orange sungolds and pink "sweet treats" 1 PINT counts as an item in your farm share. Extras for sale too. Green Beans. 1 QUART counts as an item in your farm share. Extras for sale too. Herbs. 1 Bunch/farm share. Mix and Match. Basil/Parsley/Thyme/Sage/Oregano/Rosemary/Chives. New dill and cilantro in about 2 weeks. Extras for sale, $7.50/lb. CSA week7, tomatoes and more! CSA week 7. Pickup farm shares Wed (7/18) 1-6, OR Sat (7/21) 9-2. ON THE TABLE IN FARM SHOP... New Crops! Tomatoes! Onions (reds), Leeks, Eggplant (classic/ Italian heirlooms), Green Beans (Pick-Your-Own, new field open), Peppers (green bells/jalapenos), Carrots, Potatoes (reds), Beets, Cucumbers, Zucchini (green/yellow), Cabbage, Kohlrabi (red/green), Scallions, Garlic Scapes. TOMATOES! Just coming in (no extras yet for sale). Limit 1 choice/CSA farm share: 1 pint cherries (orange sungolds/pinks), 2 red beefsteaks, OR 2 heirlooms. Cherry tomatoes will be a pick your own crop as soon as abundant. SWAPPING ITEMS - preferably, do so via Harvie email. This helps us mange the harvest better. If not, you can do so in Farm Shop, not a problem. Please note limits in Farm Shop for some crops (like tomatoes this week). CHECK IN - find your name/farm share size on master list - no more individuals printed out. HARVIE EMAILS. Based on the weekly harvest, your number of items/farm share change. Please follow your Harvie email, swap items here (if you can do so, AND in Farm shop too). FARM SHARES - number of items/farm share posted in multiple locations (mix and match, your choice). Please note limits in Farm Shop for some crops (like tomatoes this week). PICK-YOUR-OWN. All crops located in front of CSA barn AND next to blueberries. Please pick! Follow orange flags. Lots out there - tell your friends, fields open to non CSA members Wed 1-6 and Sat 9-2 during pickups. HERBS, Pick-Your-Own: 1 bunch Mix and Match/CSA farm share. Basil - make pesto! Others too... Parsley, Oregano, Rosemary, Thyme, Sage, Chives. Extras for Sale $7.50/lb. FLOWERS, Pick-Your-Own: 12 stems Mix and Match/CSA farm share. Extras for Sale $.50/stem. GREEN BEANS, Pick-Your-Own: measure 1 quart (if you choose as a farm share item for week); please transfer into your bag/basket and leave us quart containers. Thank you. Extras for Sale $3.50/quart. New field! More Beans! Next to blueberries. BLUEBERRIES, Pick-Your-Own: last week likely, get um while you can. B&B Farms thanks you for your business and support!